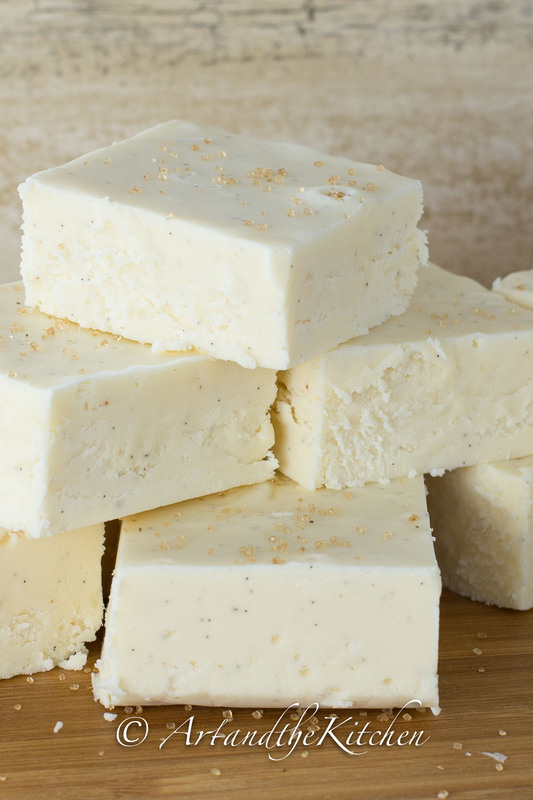 You won’t be able to resist this incredible recipe for Eggnog Fudge. 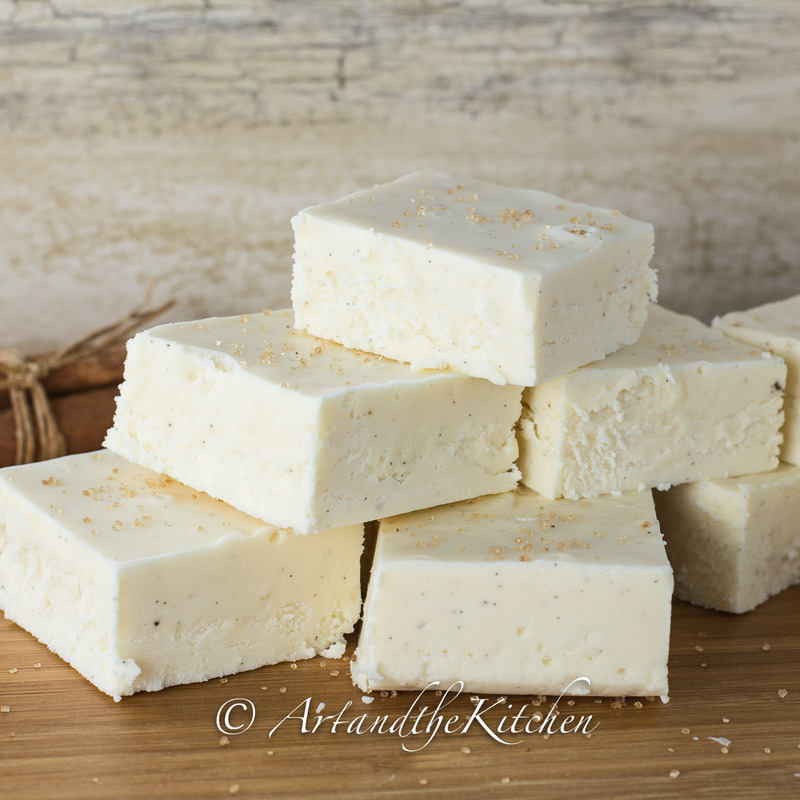 This rich and creamy fudge has the perfect balance of spice, sweetness and smoothness. 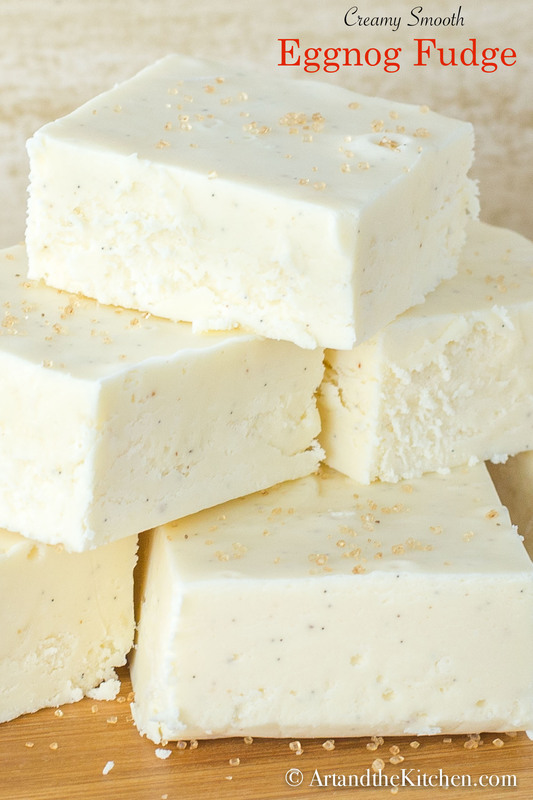 This recipe for Eggnog Fudge comes from one of my favourite bloggers Recipe Girl. I had a few of my own adaptations like using a fresh vanilla bean and just a pinch of ground cloves. I am a firm believer, if you are going to indulge your sweet tooth, make sure you do so with fine quality ingredients. Using fine quality chocolate will definitely elevate the flavour of your fudge. The top of the fudge was sprinkled with a Holiday Spice Infused sugar I had bought a gourmet food store, but you can also use a bit of nutmeg. Fudge is a terrific Holiday treat that also makes a great gift. 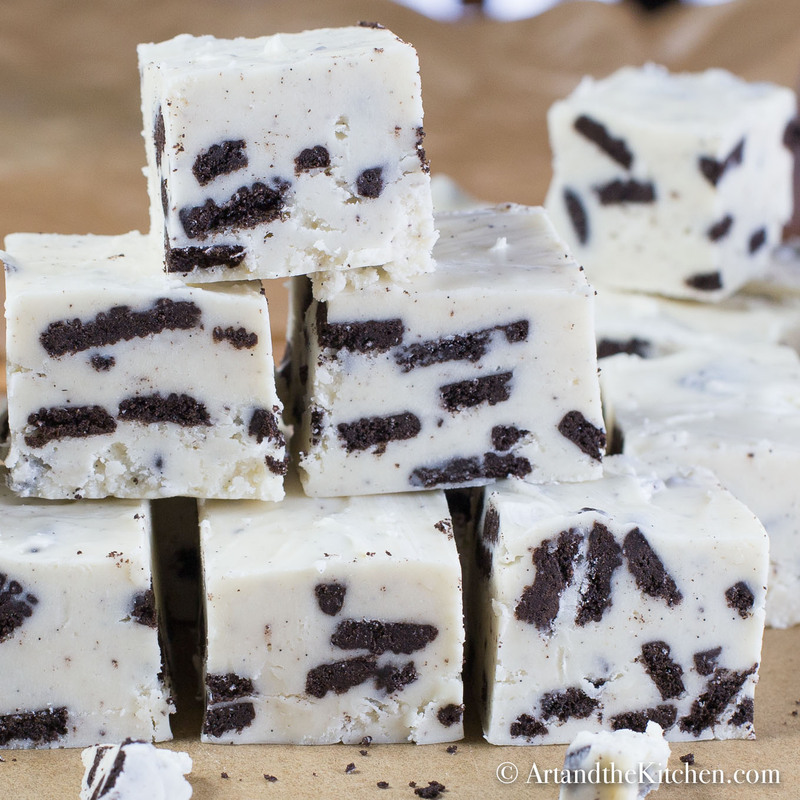 Make a few batches to keep on hand as this fudge freezes great. 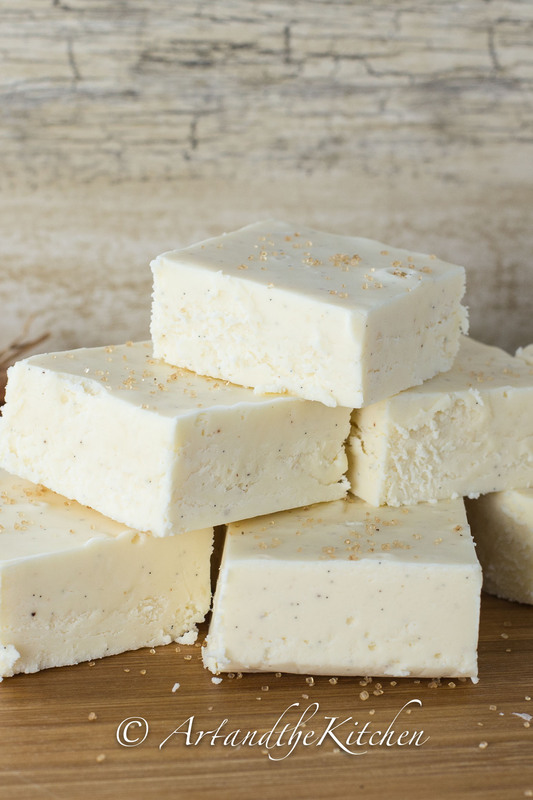 Eggnog Fudge so tasty and this recipe will make you wish they sold eggnog year round. 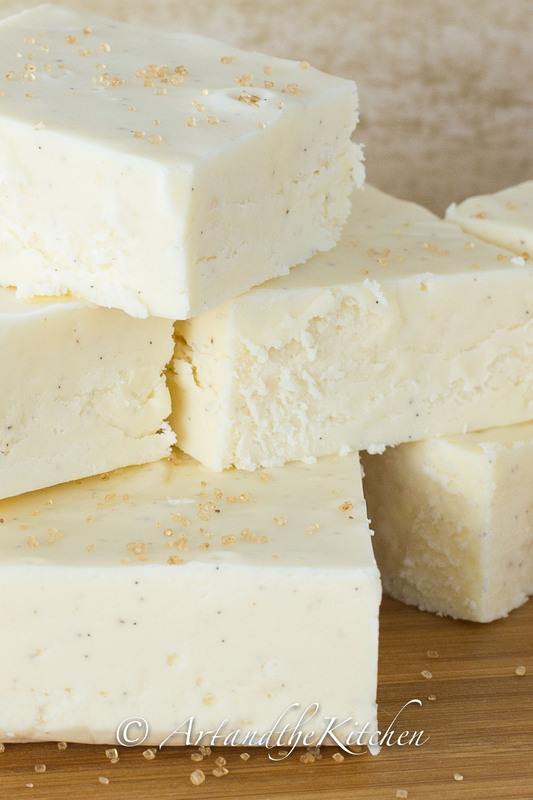 This rich and creamy fudge has the perfect balance of spice, sweetness and smoothness. Line a 8 inch square pan with foil. Lightly butter the foil. Combine sugar, butter and eggnog in a heavy saucepan. Bring to boil over medium heat, stirring constantly. Continue to cook at a rolling boil, stirring constantly for additional 8-10 minutes or until candy thermometer reaches temperature of 235º F.
Remove from heat, immediately stir in chopped white chocolate, nutmeg, cloves and vanilla bean seeds. Stir vigorously until chocolate is melted. Pour into prepared pan, spreading evenly. Sprinkle top with some nutmeg or holiday spice infused sugar. I prefer Kraft brand marshmallow creme. This fudge recipe that will be getting rave reviews, so make plenty to give to family and friends. Thanks Helen, it is pretty tasty! It says marshmallow creme is in the ingredients, but I didn’t see in the recipe instructions where it gets added. I added it when I added the white chocolate chips. It seems that may have been the right place to add it in to the sauce pan. Super yummy! Thanks Liz for catching that, I have corrected the recipe. I must have been in la la land when I wrote out the instructions. You were in fudge land..thanks for the recipe. I’ve never tried eggnog. Will have to start with this! I’ve seen this same recipe on many sites, but I’ve also read in all the comments that some people have trouble with the fudge not ever getting firm. How can we guarantee that the fudge will set up properly and not remain overly soft? Most of the recipes that have marshmallow fluff in them will be softer, but I don’t find this recipe overly soft. Can this be frozen and if so – how long? Hi Lisa, I have not froze this recipe, but cheesecakes freeze quite well and usually best if not more than a month. I think the chocolate chips would overwhelm the flavour of the eggnog. Okay, I normally am not into marshmallow fudges, but dang! This is gooood. Every year I make a ridiculous number of different kinds of fudge. So glad I gave this one a try. It is my new favorite. I followed the directions exactly, and it was perfect. I will definitely make this every year when I go on my fudge frenzies. Yum! 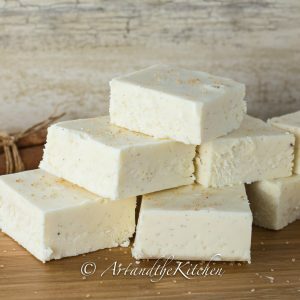 Thank you Jill, it is one of my favourite fudge recipes as well, but way too addictive lol. Am looking to make a few different types of dessert for a gathering in a few weeks. 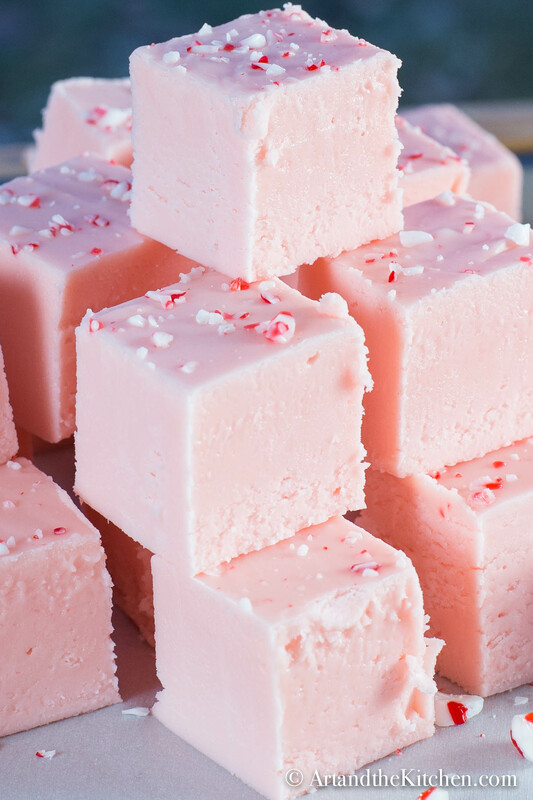 I made a batch of both the eggnog and your candy cane peppermint fudge. (Both delicious by the way!) but was looking to make it in advance to save time. Would you happened to know the shelf life for both fudges? Thank you. Hi I don’t have any Vanilla bean can I use vanilla extract in it’s place & if so how much would you suggest ? Thank you. This sounds delicious ! Hi Robin, absolutely you can substitute a teaspoon of pure vanilla extra. Enjoy. Made this for the first time and it’s wonderful! I had 11 oz of white chocolate so used it all. I also wanted it to have true eggnog flavor so I used rum and brandy instead of vanilla and OMG! My husband who doesn’t like fudge just had his third piece! Thank you so much for this recipe! It will be a Christmas tradition from now on! So glad you enjoyed the recipe, I think I’m going to be trying the rum and brandy. Sounds yummy. Have a very Merry Christmas.